It's the new rolling droid that makes its big-screen debut in the highly anticipated "Star Wars: The Force Awakens." The film opens on December 18 -- but you don't need to wait until then. You can take BB-8 home this week. It's one of more than 100 new Disney-licensed Star Wars toys that hit stores Friday. Although very little is known about BB-8's role in the movie, the startup behind the toy promises that it's pretty close to character. 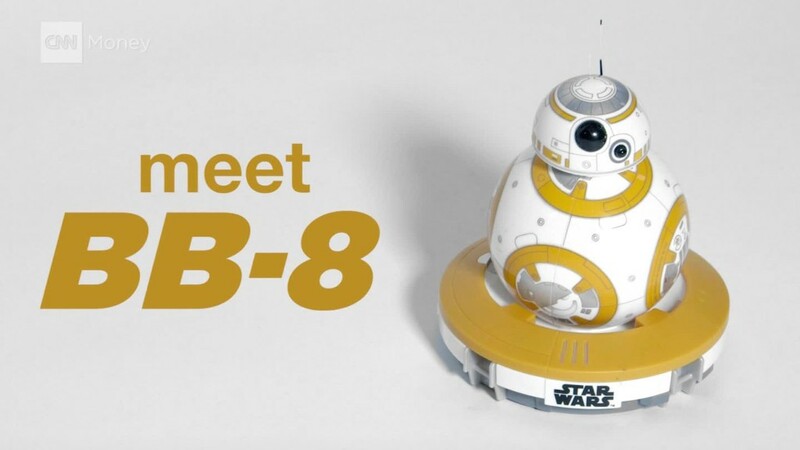 The toy version of BB-8 is a 4.4-inch robot. It has a unique shape -- the body is a ball without any wheels and the head is magnetically attached -- which allows it to freely roll around. "The ball is the perfect robotic form to give it its agility," said Paul Berberian, CEO of Sphero, the Boulder firm that created it. 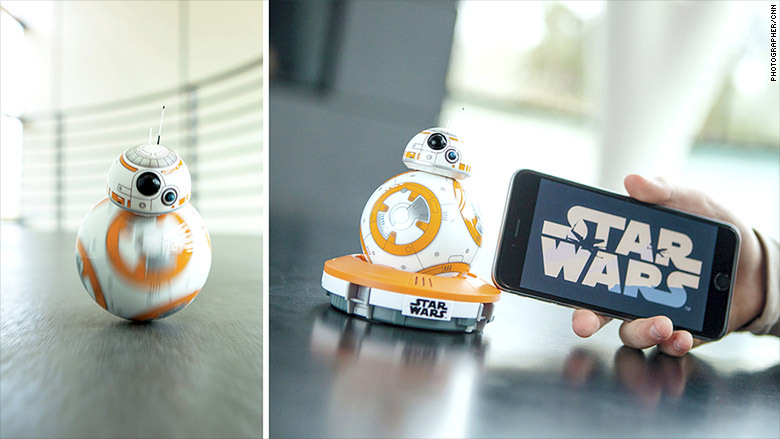 BB-8, the app-enabled robotic toy, costs $149.99. "Like its predecessor R2-D2, BB-8 is a helper and an entertainer," said Berberian. The app that accompanies BB-8 has nine built-in voice commands (it understands 12 languages). If you warn BB-8 of a trap ahead, it will stop moving and dart away. Tired of its rolling? Tell it to go to sleep. Just like in the movie, BB-8 has a holographic function. Users can record messages and then play them back as a hologram on the phone when you point it at BB-8. BB-8 isn't cheap. It costs $149.99 and requires three hours of charge time for an hour of play. It's available at Disney (DIS), Apple (AAPL), Best Buy (BBY), Bed, Bath & Beyond and on Amazon (AMZN). In 2014, Sphero participated in a three-month Disney accelerator. During that time, the five-year-old startup was essentially handpicked by Disney CEO Bob Iger to make the toy version of BB-8. "[Iger] knew us and immediately pulled out his iPhone and showed us photos from the Star Wars set and BB-8," Berberian said. "He asked if we could make it come to life." It just so happened that the startup was already working on the next iteration of its Sphero robotic ball that was "pretty close" to what BB-8 looked like. The Sphero ball was the company's first product, and it's sold 500,000. "With the Sphero ball, we wanted a connected toy that was entertaining, interactive and offered a human-like bond with its user," said Berberian. Twenty four hours after meeting with Iger, the startup had a prototype ready to show him. How big of a deal is this for a Sphero? "The Star Wars franchise has generated $33 billion -- $15 billion of it is from licensed toy sales," said Berberian. "Someone told us that we could pretty much retire off this."